When Raquel Rolnik, United Nations Special Rapporteur on the Right to Adequate Housing, heeded a call to visit the United States during the heart of the housing crisis, it was the first time a United Nations housing expert had ever formally investigated the United States. A network of more than 100 grassroots organizations coordinated her visit to 7 rural and urban communities and enabled the participation of more than 2000 individuals. This network, understanding the importance of the Special Rapporteur’s historic trip, also mobilized a nationwide team of volunteer videographers, photographers, and audio documentarians. 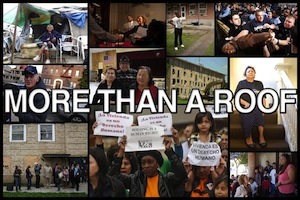 The grassroots footage gathered of Ms. Rolnik’s journey and of the powerful testimonies she witnessed from people facing homelessness, foreclosure, and the destruction and neglect of our affordable housing stock is revealed for the first time in the short documentary film More Than a Roof. We hear from families crowded into mold-infested trailers on Pine Ridge Reservation in South Dakota, on the brink of losing homes to foreclosure in the old coal town of Wilkes-Barre, Pennsylvania, camped out on the streets of Skid Row in downtown Los Angeles, and displaced by the massive destruction of public housing complexes in cities across the country. Part travelogue, part call to action, More Than a Roof is a model of grassroots media making and movement building, created by people living in crisis who believe that something better is possible.